Anyone want to add a review? Cloudbet Stole me 30BTC !! - Reasons why I deposited big: I am new to crypto casino, didn’t know much scams before, trusted their license (Montenegro license which I found out it’s actually an empty license after I was scammed, which means they operate WITHOUT license! ); also they claimed to have highest limits and I saw each premier league game they could take up to 10-15BTC per bet max. - Honestly speaking, this scammy company opened account and took deposit at lightning speed, as their promotion slogan. - Betting result: Won 5BTC via betting on big matches like premier league, Bundesliga, LaLiga games. - 3 weeks ago, when I tried to withdraw, they asked me to verify my phone number, I did. Then they asked for all sorts of docs like passports, address proof etc. I provided them straight away. - My withdrawal didn’t go through, it’s in “pending” status for over 2 weeks. I kept chasing but they just gave copy-and-paste sort of reply like “it’s being processed by our payment department, as soon as that process is finished you’ll be able to receive your winnings”, “I’ll leave a note to our payments team so that it will be processed as soon as possible”, ”I understand your frustration but unfortunately I am not part of the payment teams/investigation/ security teams” etc. You know, typical Scambet style. - It’s particularly hilarious when you know this company it’s being operated by 5 staffs/shareholders/thieves. But nobody working there knows what’s going on in the company. They took my deposits instantly, without any needs to check, as stated online “You don’t need to provide Cloudbet with any personal information, all you need is an valid email address”. But don’t dream about withdrawals GUYS, they will pay you as soon as they finish all their internal procedures which no one could ever tell you what it is. They just pick big or winning fish to SCAM, as simple as that. I wouldn't advise players not to join, as it is actually a perfect platform for losing players, fast account opening, lightning deposit and can take big bets! They won't bother you at all if you lose and withdraw the penny leftovers. - My account was being locked since 2 weeks agp. No emails, no nothing. Scambet support told me last week that their colleague would write me an email soon but guess what, NOTHING, of course! They only care about how much they could steal from you further. Till the day you build up your trust in them and deposit / win big, your value is done. Harvest time! Once you are trapped, they disappear! - Now they are holding me up 30BTC , and I couldn’t login to my account anymore…. Thanks for the post and warning. BetCas F ............................accepting deposit with unpaid players. Bitbm F .............................accepting deposits with unpaid players. Powerbet F (2016) ............................accepting deposits with unpaid players. bitsport.bet closed 4/11/18 still owing players. betmatch.is apparently doesn't work for some time already. Thanks bur4n. It's now reflected in the guide. 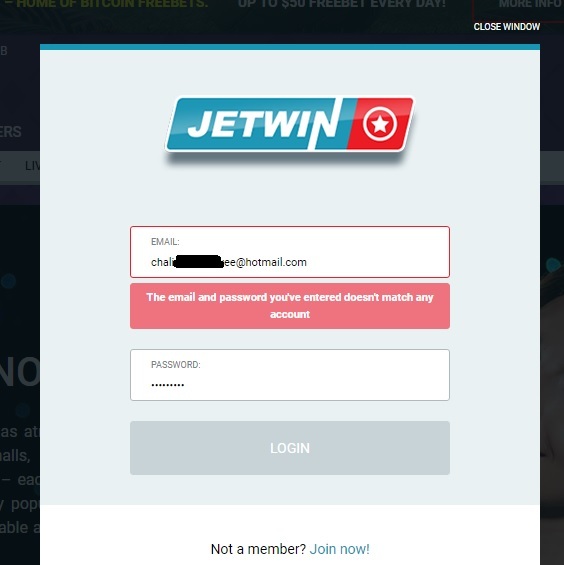 A heads up that Jetwin has been down on its sportsbook for a few weeks now. jetwin.ps B- (2013) Currently under maintenance. Feel free to post any problems and I'll contact the sportsbook on your behalf. Most of the books are easy to deal with. My balance in the account was slightly over $1,000 with all of my winnings coming from their live casino games. I maintained a huge bankroll there to martingale. 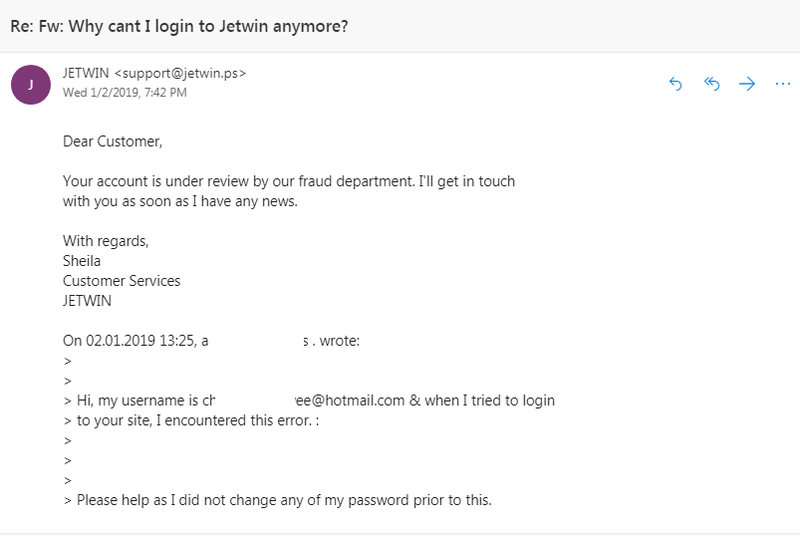 My last successful withdrawal from jetwin was on 30th Dec 2018, then all of the sudden on 31 Dec 2018, I couldn't log-in anymore. Jetwin will be back up at the end of January. Books - if you have a promo, feel free to post it or shoot me a PM. Those are fine to post as long as they aren't repetitive.